Sardaville Game and Holiday Ranch - Warden Akkommodasie. Built in the early 1900's, this self-catering sand-stone manor house is tucked away in the slopes of the hilly terrain and boasts panoramic views of the valley. 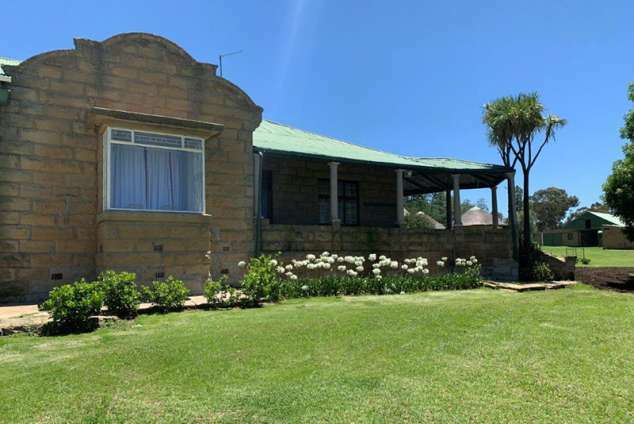 With 5 crackling fire places to keep out the winter chill, a billiard room, bar, a large outside lapa and a truly Free State farm style kitchen, the manor house can accommodate up to 17 people sharing. Scattered around the house are two additional units and a rondawel that combined, can accommodate another 18 people. These rooms each have an en-suite bathroom. Bergvilla is built high up on a mountain slope, overlooking a small hillside dam. It has been rounded off with a large deck with a boma fire pit, offering endless views of the valley. Bergvilla has a truly romantic feel with a large indoor fire place. The villa has been built with the environment in mind and is totally self-sufficient; built with materials sourced from the immediate vicinity, water supplied from the natural water spring and all lights running off solar power. The villa is ideal for smaller group or families who want a quick escape from the city and experience nature in its truest form. It can accommodate up to 4 people. Bergvilla is a self-catering unit stocked with all linen, bedding and towels. 100 besigtings sedert 06 Feb, 2019.